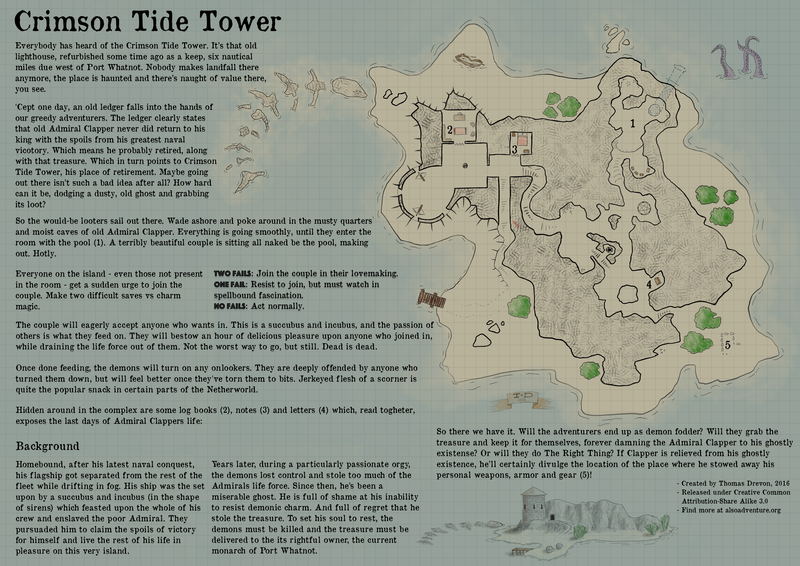 Lo, my first ever submission to the One Page Dungeon contest! No disclaimers about lack of time or artistic practice, just the adventure for ya. Please let me know what you think! Though I gotta say, a quick look at one of my fellow competitors makes me realise I’m not a pro yet. Check out Werkes submission for some eye-searing goodness. That’s a nice piece of design right there. It’s not about winning. I’ve been submitting entries (of wildly varying levels of quality, IMO…) since I think 2010, and have never come close to winning. It’s about plugging away and learning something each time. You’ve got skill and talent; you need those and about two good, solid ideas to make a fantastic OPD entry. Thanks for the encouragement! You’re absolutely right, it is indeed about practice^squared and a couple of good ideas. My idea this time around was so so. Next time it’ll be better. And luckily, I find the practice in this field very fulfilling in itself. Did you have an entry? Which one? Meh, I had Magic Shop Mayhem, which has at least two good ideas, but I failed in the execution. Like most years, I had a different idea I worked on for months previously, and then realized it was not going to work with only a week or less to spare. So I end up polishing gravel to make something for the contest. I was much prouder of The Lanisha Crisis and The Blackacre Heist of previous years.